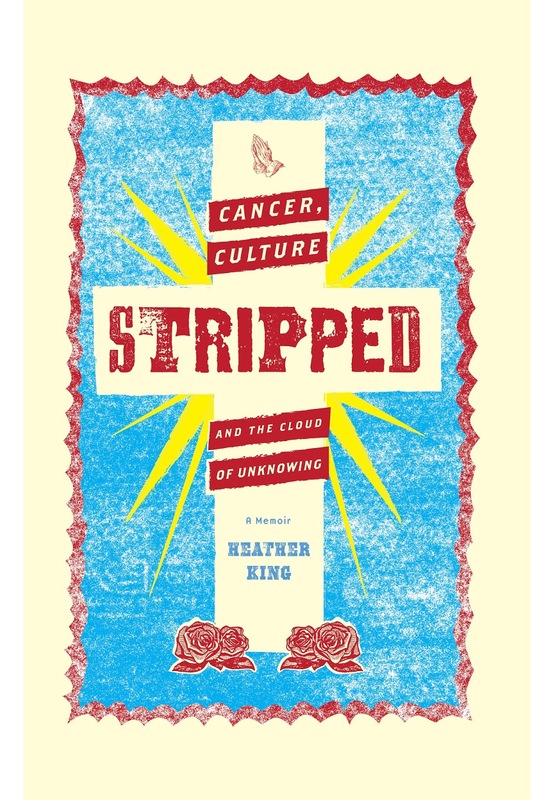 Not your usual cancer memoir. No baldness, no nausea. Hell, no! I went AMA (against medical advice. And 19 years later, I'm still alive to tell the story. In 2000, I was diagnosed with invasive breast cancer. The good news: a small tumor; the least advanced stage. Still, doctors recommended surgery, radiation, high-dose chemo, and five years of the aggressive hormone drug Tamoxifen. Terrified of dying, yet determined to steer my own course, I began researching. I learned that chemo could kill, radiation could cause secondary cancers, Tamoxifen had severe side effects, and long-term studies on any of those treatments was virtually nil. 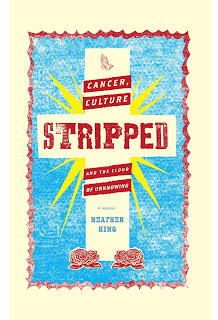 Stripped is a memoir about coming to the decision to have the tumor surgically removed—and to forego all further treatment. It's about being nailed to the cross where mystery, paradox, and a sense of humor meet. Which is maybe why the very best thing to come out of that dark-night-of-the-soul year was the phone call I made to my friend Brad the night I got my diagnosis. The century of health, hygiene and contraceptives, miracle drugs and synthetic foods, is also the century of the concentration camp and the police state, Hiroshima and the murder story. Nobody thinks about death, about his own death, as Rilke asked us to do, because nobody leads a personal life. Collective slaughter is the fruit of a collectivized way of life. --Octavio Paz, from "The Day of the Dead"
At 4:28 on the afternoon of January 3rd, 2000, I breezed into the lobby of Mercy General Hospital, just west of downtown L.A. Glancing at the heart-shaped Mylar balloons, the saccharine greeting cards, the cheesy arrangements of carnations and baby’s breath that spilled from the gift store, I wondered which would be more depressing: sickness itself, or having to lie in bed surrounded by that schlock. I’d purposely taken the last available appointment of the day so as not to cut into my schedule of writing and errands, and having squeezed a trip to SuperCuts, a clothes-buying spree at the Hollywood Goodwill, and a visit to the library into the previous three hours, the waiting room struck me as eerily still. The only other patient was an old black woman with bandaged legs, dozing in a wheelchair. Sickly fluorescent light trickled from the ceiling, a series of air-brushed sunset photos hung from the opposite wall, and beneath a sign reading COFFEE FOR PATIENTS ONLY, the hotplate sat empty. A pleasant young gal with the Virgin of Guadalupe tattooed on her neck made a copy of my insurance card and motioned me to take a seat. Littered over chairs, strewn across end tables, and overflowing from two plastic holders bolted to the counter were copies of a breast cancer magazine called MAMM. The name made me snicker: years ago my husband Tim and I had seen a friend in a stage production of “Little Women,” and he sometimes still called me Marmie. Marm. Are you coming to bed, Marm? I’m going out, Marm, do we need anything at the store? A marmogram. I picked up a MAMM, paged randomly through to a table showing survival statistics, and quickly put the magazine down. I’d had a mammogram every year since I turned forty, seven years before, and though I always acted as if I were performing a civic duty under mild duress, as if the whole thing were a big waste of time because of course I was fine, deep down I always approached the appointments with dread. That the payoff for conscientiousness might be disfigurement, suffering, death, seemed so unfair—if so typically one of life’s myriad ironies. I sighed, glanced at the clock, and opened the book I’d brought: Rilke’s Letters to a Young Poet. “Miss King!” I heard, and looked up to see a pretty, dark-haired woman in a polyester Op-Art smock. “Right here,” I said, scurrying to grab my purse. "Sorry" I mumbled, thinking So is reading a crime now? My forays into the real world tend to be halting and tentative, and I enjoy them for only limited periods of time, like visits to relatives, until I gratefully retreat again to my books. Behind the makeshift curtain, I draped my black muscle shirt and black bra over a padded chrome chair, donned my johnny, told myself I’d be back in ten minutes, and emerged. Against the far wall hulked a large, insect-like machine of beige metal. I approached gingerly. “Turn to the right” the technician said and I instinctively stiffened. Having been through the drill many times before, I knew exactly what to expect, but that made me more, not less, nervous. She hefted my left breast onto a glass plate, massaged my treasured appendage flat, like a piece of dough whose edges might spring back if released, and electronically lowered a second piece of glass, snatching her fingers away at the last second so as to prevent mangling and leaving my own flesh compressed in a painful, vise-like grip. That a single breast could cover so much ground—squished out flat down there, it could have been a pie crust—I found mesmerizing. Then she stepped behind a screen to take a picture, repeated the procedure on the other side, slapped some labels on the slides. “Hold on, I’m just running these down to the radiologist,” she then threw over her shoulder, and disappeared down the hall. I perched on the edge of a plastic chair with my book, but all the people in scrubs and lab coats walking by made concentrating difficult; besides, my johnny was missing a tie and I needed both hands to clutch the front shut. I tried to empty my mind, the way the contemplative mystics I so admired were able to do, but I’d planned on taking a walk afterwards, I wanted to be home by 6:00 when Tim, an intensive care nurse, left for his night shift and, after a few minutes, I started getting edgy. When the technician finally cruised back in, I was all set to jump up, get dressed and bolt. And then I heard the nine words that ripped my world in two. “He wants a second picture of your left breast,” she announced, casually loading a new slide. Adrenaline jolted through my body like electricity; I had a sudden an urge to sink to my knees and grab her around the ankles. “WHY?” I pleaded, in a weirdly loud voice. “Oh, he thinks he might have seen a little shadow,” she said, beckoning me back to the machine with the merest hint of impatience. Unfortunately, I was incapable of responding with my usual alacrity, as the part of my brain that governs motor skills had been suddenly appropriated by a mile-high neon sign that pulsed: CANCER! CANCER!! CANCER!!! Eventually, I shuffled over, weak with fright—in the space of seconds, I seemed to have been transformed into an old lady—and robotically removed my arm from the johnny. “Relax,” the tech commanded, trying unsuccessfully to loosen my wooden shoulder: rarely tension-free under the best of circumstances, and my body now had all the pliability of a rigor mortis victim. She lowered the glass plate again—“Don’t move!—ran behind the screen to take another picture, and re-disappeared down the hall. I had never paid much attention to my body, which was perhaps why it was the one area of my life that was now characterized by moderation, that wasn’t fraught with angst, that radiated health. I couldn’t remember the last time I’d had the flu, or even a cold. I hadn’t had a drink in twelve years or a cigarette in ten, I exercised, I ate grains and fruits and stout dark greens like kale and rapini, and though I enjoyed clothes and even had a bit of a vain streak, that more or less wrapped up my regimen of personal care. I had no truck with vitamin nuts or vegans, and I considered nutritionists, chiropractors and acupuncturists to be a bunch of overpaid quacks. Partly I was too impatient to devote special care to a body that was already sturdy and serviceable. Partly I believed I’d been granted good physical health in return for my somewhat fragile emotional health. And partly I’d inherited this attitude from my dyed-in-the-wool Yankee mother, who classified ginger ale as a medicine, considered Novocaine a snobbish extravagance and, after the birth of her last child, had gone twenty-nine years without seeing a doctor. I’d always considered Mom slightly over-the-top on the subject, but I had to admit that I, too, had come to treat my body firmly and without emotion, the way you would a dependable tractor. I couldn't remember the last time I'd had so much as a cold, and even during the worst of my drinking, my contact with doctors had been limited to an occasional trip to the ER for strep throat or stitches. Take a walk, I’d inwardly snort when people with vaguely-defined conditions like chronic fatigue syndrome or candida started complaining. In New Hampshire, where I grew up, people didn’t go to doctors: they worked. They laid brick (as my father had) or dug vegetable gardens or shoveled snow, and though I myself had always shrunk from such activities as being way too strenuous and time-consuming, I still saw exercise as the surest way of staying healthy, and I still couldn’t stomach the rarefied idea of paying money to do it. I walked to the library or bank or grocery store instead of driving, I took ten-mile hikes in the San Gabriel Mountains, I played tennis for two-hour stretches at a public park in West Hollywood. On summer afternoons, I drove up to the battered courts at L.A. Community College, where tufts of grass grew between the cracked green clay, and hit old balls against the wall for practice. Working on my backhand in the blazing sun with a discount Big 5 racket, it was a little point of pride that I still weighed the same—118—as when I’d played basketball in high school. Still, lately I’d started to feel protective and slightly sad about my aging body: the blue-green varicose vein that had sprung up on my left calf, the loose skin on my upper arms that quivered when I caught myself off-guard in the mirror. And now, shivering in the corner of the mammogram room, I thought wildly, I’m not old enough to get breast cancer! Before I could ask anything more, she was in the back room dialing her phone. “Yeah, so 850 for the roof and what about the window frames?” she was saying. I gave her a little wave when I left, but she never looked up. On the elevator down, I thought, They must do hundreds of mammograms a week. They must ask for second pictures all the time. A shadow, she said. How bad could a shadow be? But at the same time I had a vertiginous sense that I had walked through the looking glass, into a dream state where my worst fears and reality had finally collided, and when I reached the ground floor, I stopped in at the chapel. Hospital chapels are like airport terminals: way stations between heaven and earth; limbos where space and time are suspended. Votive candles burned on a terraced plastic trolley, an enervated Christ stared benignly from a mass-produced icon on the front wall, and leftover holiday music issued from hidden speakers: “O Come, All Ye Faithful,” sung by what sounded like a choir of embalmed monks. The wards above were filled with sick people in their beds, but no splatters of blood, no scalpels and forceps, no birth cries or death rattles intruded here. My own taste ran more to lacerated crucifixes, old wooden carvings of sorrowing saints, Gounod’s “Ave Maria” sung by an obscure Italian castrato—but if the hospital had aimed for the blandest common denominator, at least they had aimed. I thought of the tears that must have been shed in this tiny room, the agonized prayers that had been whispered, the hearts that had cried out in anguish. I felt the anguish of my own heart: twenty years lost to drinking, a marriage about which I was torn, the recent death of my beloved father, a life-long sense of searing existential loneliness. After awhile my prayer no longer consisted of words. After awhile I just knelt there—helpless, flawed, alone. St. John of the Cross wrote, “The Father spoke from all eternity just one Word. And he spoke it in an eternal silence. And it is in silence that we hear him.” I’m pretty sure I really heard him that afternoon because after awhile, there in that sterile chapel, I experienced a moment of peace such as I never had known before and never have quite known since: a feeling that I might be in for who knew how long a session of sheer unadulterated hell but that somehow, in the end, things would be all right. I’d had moments of peace before, but this moment had a new dimension: this time I knew things would be all right even if I died. Later, when I was going up to ultrasound on the day of my surgery, I was shocked to see the same technician who’d done my mammogram behind the counter in the radiology department: flipping through some files with her long red nails and looking bored. So complete a cutting-off day had that been for me that I could scarcely believe we still inhabited the same world. But of course we did not. She still lived in the land of the well. I had entered a land in which the only area where I had ever been well had been stripped away.